These ruler work classes - Ruler Work Skill Builder Series 1, 2, and 3 - are designed for the quilter who knows the basics of ruler work on a home sewing machine and is ready to explore more challenging designs using ruler work. 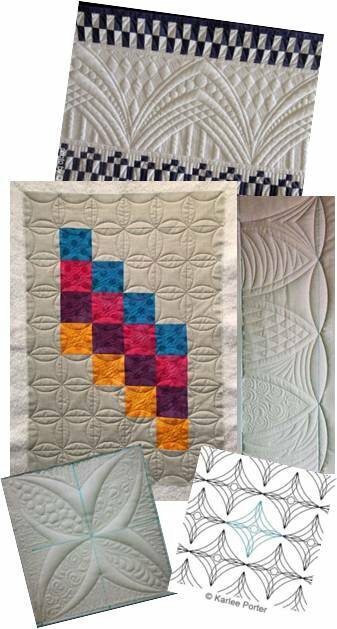 Each Skill Builder Class is a stand alone class and geared to bolster your ruler work skills, your free motion quilting skills and your design skills. Note: pre-requisite class: Ruler Work for the Newbie. Requirements: Pre-requisite Class: Ruler Work for the Newbie. Ruler Foot for your brand of sewing machine. Westalee 12" arc and Sampler Set 1 Rulers. $2.00 fee for handout payable to instructor at the time of class.